We have our administration office located at Hong Kong, while order processing office located at Guangzhou, China. You may contact us at here. We focus on Chinese ethnic clothing of cheongsam, qipao, tangzhuang, zhongshan-zhuang (Mao suits), hanfu (Han Chinese clothing), kung fu clothing, footwears, etc. Please pay us a visit from time to time as we are continuously adding new items and new categories. 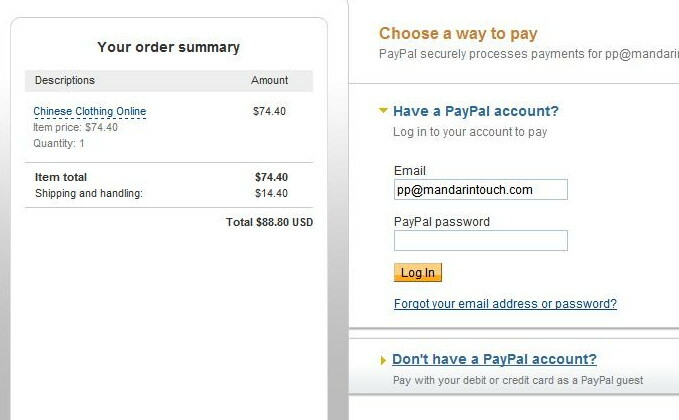 We use PayPal as our online real-time payment gateway. The payment transactions take place in a secure encrypted environment of Secure Sockets Layer (SSL) between you and the payment gateway directly and we are not informed of any of your credit card details. We only receive a notification from PayPal indicating the final result of your payment. We consider paying online is more secure than the traditional way as it does not involve any shop assistant who might disclose your credit card information. For further information, please visit www.PayPal.com. It usually takes around 4 ~ 8 business days for ready-made items or 8 ~ 15 business days for most custom-made clothing items to arrive at destination of major American and European cities if shipped by Express Courier. Some items might require longer preparation time, please always refer to the specific product item page for lead time information. Some delay might be expected in case of bulk order or stock shortage, and we will timely keep you be informed of such delay. Delay caused by import customs clearance may also sometimes happen. Note: For request of urgent delivery, please specify when ordering and we might be able to shorten our preparation time if condition permits. Just click the products of interest with all necessary options selected and add to your shopping cart follow by clicking the checkout button to pay. Our system will prompt you to log in or create an account if you have not done so. Our web site will guide you step-by-step to complete the ordering process. If you choose to pay us offline, please Contact Us to manually enable the offline payment option for you. Yes, you may do so if your order has not been shipped by contact us with the details. To add item requires you to pay the additional amount which we will inform you accordingly. To delete item involves either a full store credit refund or 95% cash refund as subject to a 5% cancellation charge. Note: All custom-made, tailor-made, plus size and personal name, slogan or logo imprinted items are NOT subject to cancellation once under preparation. Yes, you can cancel your order if it has not yet been shipped. A 5% cancellation charge will be imposed to offset banking and handling charge. Note: All special orders including custom-made, tailor-made, plus size and personal name, slogan or logo imprinted items must be paid in full at time of order and may NOT be cancelled once your merchandise is under preparation. Do you accept custom-made orders for clothing? Yes, we accept custom-made orders for a wide variety of clothing items. Please look for the items under custom-made categories. Yes, please refer to product page for per item quantity discount as well as order discount based on net order amount. Note: All discounts will be applied automatically as you checkout. Air Parcel This is a low cost shipping method via Post Office. For major American and European cities, a rough estimate of 10 or more business days of arrival time would be required (customs clearance time not included). Express Post This is an express air parcel post service offered by Post Office. For major American and European cities, a rough estimate of 6 - 8 business days of arrival time would be required (customs clearance time not included). Express Courier This is a fast and reliable shipping method recommended for time sensitive orders. For major American and European cities, it usually takes 3 - 5 business days to arrive (customs clearance time not included) and provides full tracking service right from the collection point. Rural or normally uncovered areas may subject to billing of extra charges. Once your package is dispatched for shipment, we will notify you immediately the associated tracking or way bill number. CASH REFUND for any authorized return other than product damage or error on our part will be subject to a 15% re-stocking fee to offset our handling and banking costs. You have a choice of full STORE CREDIT REFUND for all authorized returns including product damage or error on our part. Shipping charges are not refundable other than error on our part. Note: All unauthorized, "freight to collect" or surface mail returns will be refused and no credit will be issued. Please Contact Us before you arrange to return, our customer service colleagues will give you full return instructions with address to return and might also give you some useful advices. NO RETURNS WITHOUT PRIOR APPROVAL. All returns must be carefully packed in appropriate packaging and shipping cartons with all shipping charges prepaid. We will process your return once received, but you are responsible for any misfortune during shipping. Note: All unauthorized, "freight to collect" or surface mail returns will be refused and no credit will be issued.